Hailed as the ferry of the future, the catamaran ferry rose to prominence on the seas around the British Isles with its combination of ferry democracy and catamaran speed. The catamaran has captured the fast ferry market in a way that the hydrofoil and the hovercraft both failed to do. Its successful combination of speed, comfort and capacity has helped keep ferry travel modern and practical in a time when the industry is faced with fierce competition from cheap airlines and the Channel Tunnel. The catamaran has, for instance, helped to open up the lucrative market for weekend trips across the Channel. Whereas a weekend away travelling on a lumbering behemoth ferry would be out of the question, with many travellers seeing three hours a cut off point for a journey. 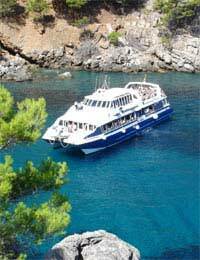 But a quick sneak across to France on a sleek catamaran is a tempting proposition. Far from being a recent phenomenon, the catamaran has for a long time been vying for a slice of the British ferry market. 1874 saw a sailing catamaran formed by two boat halves connected by beams make its debut appearance. However, the Castelia proved troublesome to manoeuvre, managing to damage the Dover pier on its 1875 maiden voyage. Not surprisingly it failed to capture hearts and minds and it service was a brief one. It was another hundred years before a successful catamaran passenger ferry hit the waters, when the pioneering Norwegian Westamaran was first launched in 1973. This early endeavour proved a local success, with the design dominating high speed ferry travel up and down the Norwegian coast. The ripples of the Westamaran didn’t make it over to the UK however, who by that point were distracted by their own innovators - the hydrofoil and the hovercraft. It was only when British company Hoverspeed started looking beyond their hovercraft for a more ambitious high speed design that attentions finally turned to the catamaran. However, the catamaran snapped up by Hoverspeed in 1990 and christened the ‘Seacat’ was a major leap forward from that Norweigan pioneer. The Tasmania technology company Incat had not only created the world’s first fast passenger and vehicle ferry but one that would revolutionise the industry. The Seacat was quickly put to work on the Portsmouth – Cherbourg crossing and it wasn’t long before its influence spread to other travel routes. Condor, purveyors of fast ferry innovation, added a passenger-only catamaran to its fleet in 1991, and were impressed enough to follow it with a car-carrying model in 1993. The latter, the Condor 10, proved hugely popular and was credited with revolutionising the UK to Channel Islands ferry service. 1996 saw the Stena Shipping Line introduce three 1500-passenger High-speed Sea Service (HSS) vessels to its routes between Belfast and Stranraer, Holyhead and Dún Laoghaire, and Hoek van Holland and Harwich. These 20,000 tonne monsters maintain an in-service speed of 40 knots and, even now, remain the largest ‘fastcraft’ in the world. Brittany Ferries entered into the fast ferry business in 2001 when it forged a partnership with Condor. Ever loyal to fast ferry innovation, the latter had recently acquired two trailblazing new Incat-built catamarans, the Condor Express and the Condor Vitesse, and it was the Vitesse that was to herald this new business alliance when it began operating a daily service between Poole and Cherbourg in May. With a 2hr 15 mins journey time, it was the fastest route to the French port from the UK. Until the next fast ferry innovation arrives, the catamaran ferry has firmly established itself as the standard for speedy sea crossings around the British Isles. It dominance was firmly established when Hoverspeed’s Seacat model was chosen to replace its one-time rival - the faster and in many ways more innovative hovercraft - on its Dover - Calais route in October 2000.